Constructions are underway at 228 Peace Memorial Park’s amphitheater to renovate the seating area. The dated wooden benches will be replaced by new facilities employing wooden parts, in the interest for preserving old memories. According to the Parks and Street Lights Office, the old benches have been damaged severely by the elements over the years. The wear and tear over long period of time has rendered some of the equipment beyond repair, requiring replacement. Furthermore, the floor area has also seen overgrowth of tree root penetrating tile pieces at certain parts of the venue. Renovation and replacement work of benches and tiles has commenced on August 31, with completion date slated for December 17, 2018. Plans of the renovated area indicate that the renewed seating in the amphitheater will employ wooden parts combined with cement material, as well as a reorganization of walkways to create more spacey and comfortable seats while installing zones for disabled individuals and providing barrier-free access. 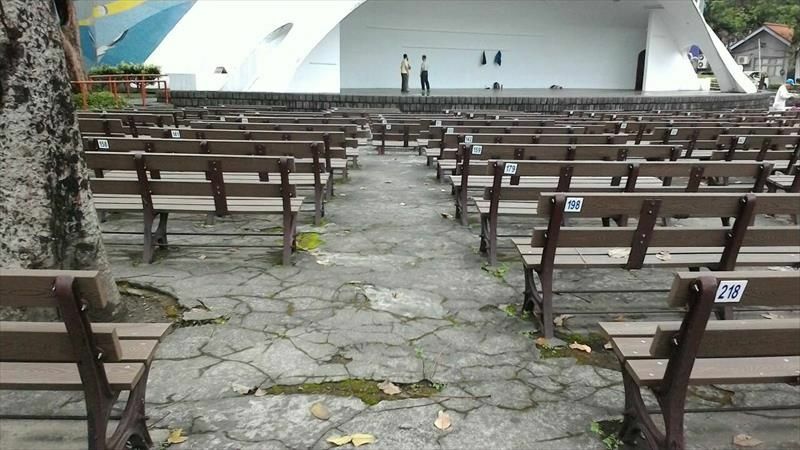 Furthermore, wider gaps have been left on the amphitheater audience area for the trees to grow their roots, thereby diminishing the impact of growing roots upon the pavement as well as expanding the future coverage of tree shades for the audience.